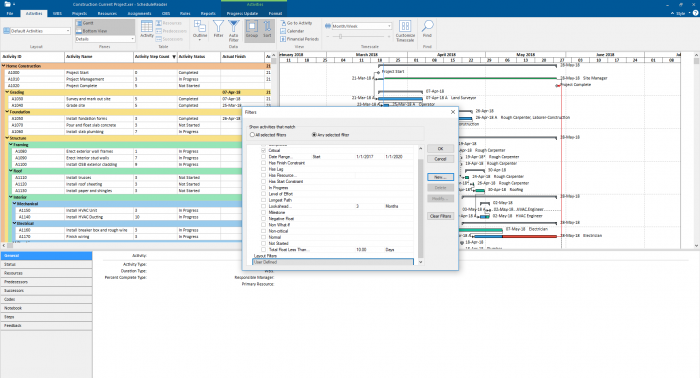 ScheduleReader™ is a standalone desktop application for viewing XER, XML and XLS project schedules. It is designed to replace the flow of sharing project data as static PDF files, by delivering a detailed and dynamic view of data contained in the schedule files among all parties involved in a project. 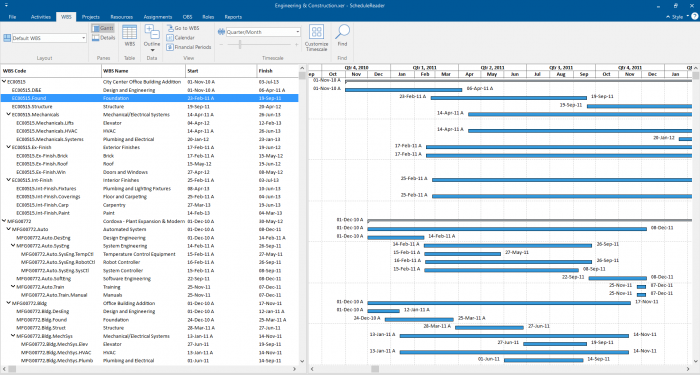 ScheduleReader™ is available in both Standard and Pro version. A 15 day Free Trial containing both versions is also available for download from the official website. This feature enables a detailed overview and graphical representation of the activities included in the project schedule. 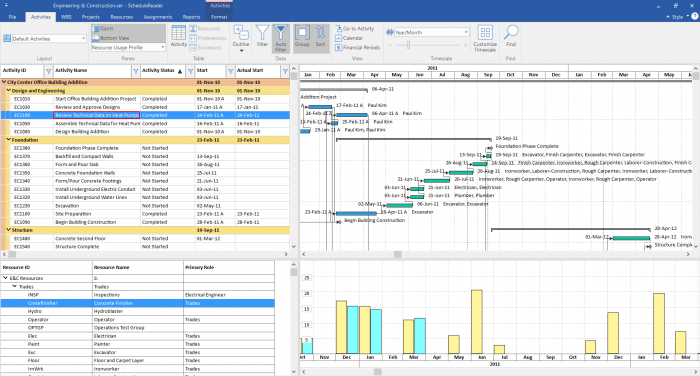 Benefits: Users can view information in the Activities panel, which is divided between the Activity Table on the left side, the Gantt chart on the right side, options ribbon at the top and the details view at the bottom of the screen. 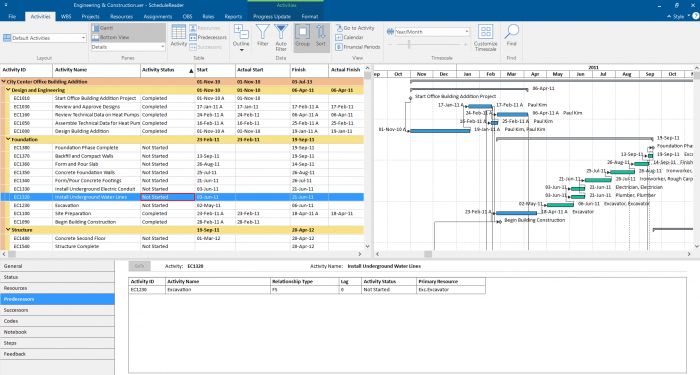 The Work Breakdown Structure view offers an elaborate overview and decomposition of the work to be executed by the project team. 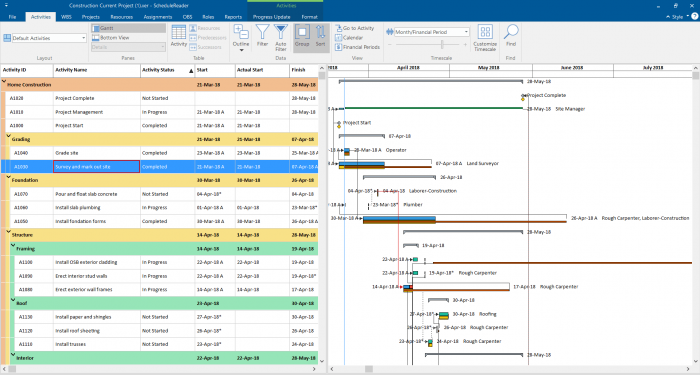 Benefits: Users can preview the Work Breakdown Structure (WBS) for the currently open project accompanied by a Gantt chart on the right. Each user can personalize the project view by customizing the order and design of different project elements according to the project specifics. 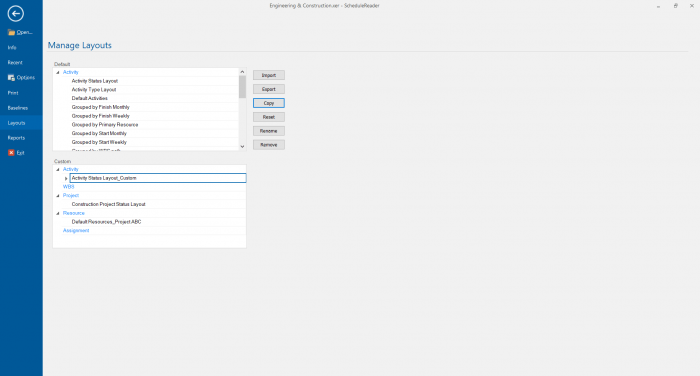 Beside layouts, the users can create custom Filters and Groups by applying single or multiple criteria. Benefits: Users can create their preferred working environment and ensure aligned working in the same view between all team. Beyond importing and modifying their .plf P6 styles, they can create custom filters, group data in lots of different ways and save that view so they can access it in an instant. Benefits: Team members have a complete overview of the project relations and don’t feel isolated from the whole, navigate through predecessors and successors. With this new feature, users can insert proposals for updates in the Activity and Assignments views. When users enter the “Progress Update” mode, they can preview several new columns where they can update % Complete, Actual Start, Actual Finish, Activity Status and Activity codes. The fields available for update will depend upon the working habits and the existent workflows in the company, but usually, the Project Scheduler is the one who defines this. The resource tab shows a list of all resources needed to complete the projects included in the Enterprise Project Structure. Benefits: Users can view the availability limits, unit prices and the calendar which defines their standard work time and non- work time for each resource. 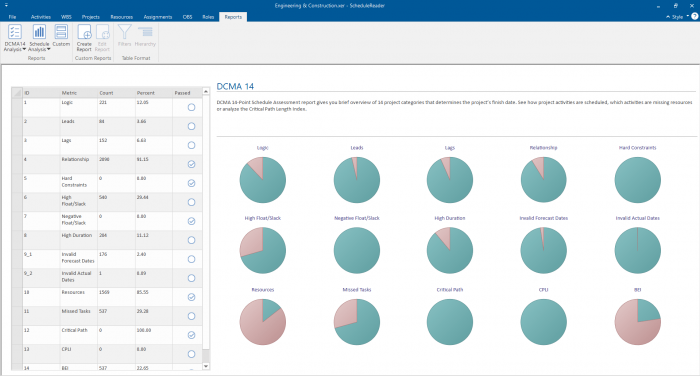 The Assignments view shows a display of the resource allocations across all imported project schedules. 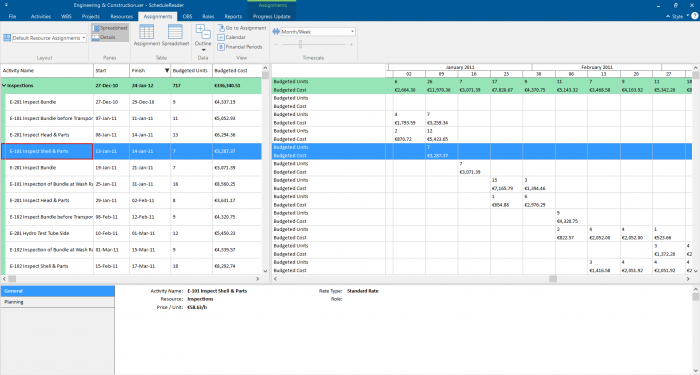 Benefits: Users can view resource usage, cost and quantity information in a detailed spreadsheet and can use curves to define any nonlinear distribution of resource usage. 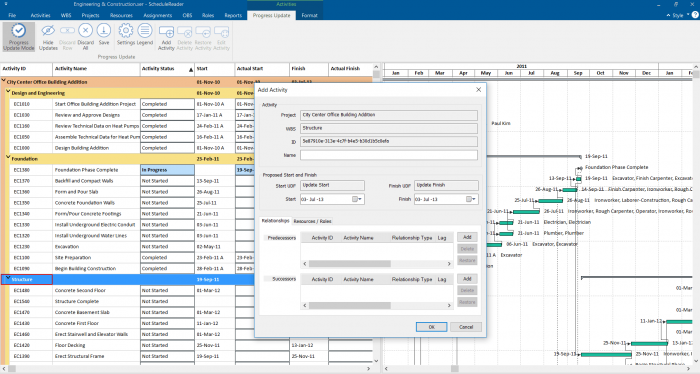 The baselines functionality enables comparison of up to four updated versions of a project schedule. 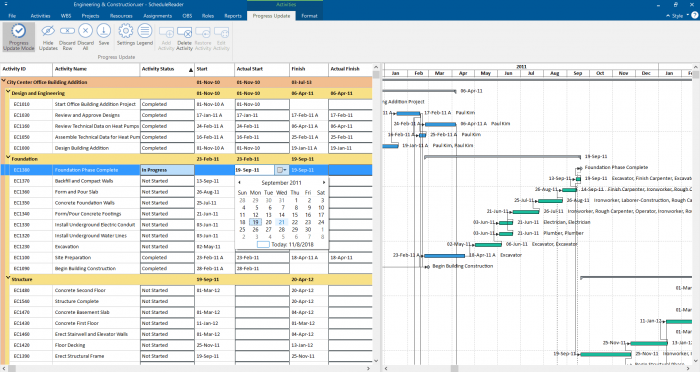 Benefits: Users can get a detailed graphical presentation of the aspects that have been changed from the original schedule in the Gantt preview on the right side of the interface. Auto Filtering allows filtering of the data in one or more columns according to the cell contents. User-defined filters allow you to specify exactly which Activities related information you need to view in the Activities table. Benefits: Users can view and navigate the display of data of interest from the activities in the project schedule, particularly if it is a large schedule. You can organize the project profiles and specify which information to be displayed in the graph: costs or units. With the use of the Resource Usage Profile, you can analyze the cost and quantity usage for roles and resources, for a single project or for multiple projects. This feature enables you to work with default report categories or to create your own and share it with your team. 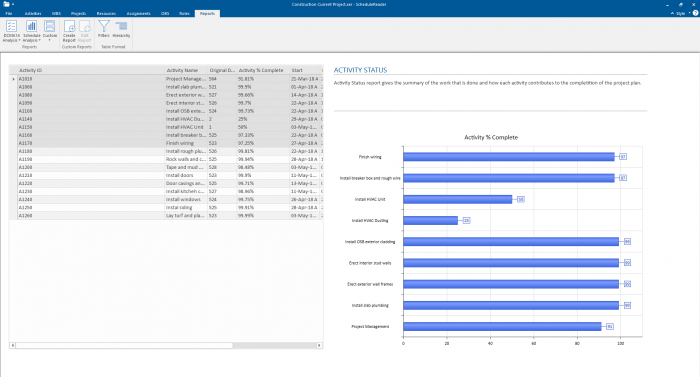 Benefits: Create default and custom reports instantly, analyze project KPIs and schedule quality, measure the project progress and communicate information more effectively with all project stakeholders. 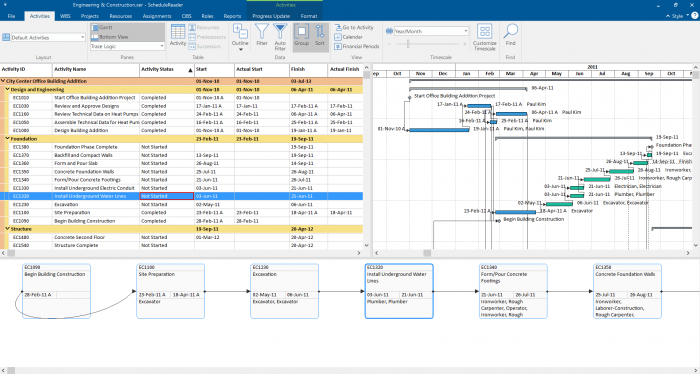 (1) Provides an interactive overview of the project - each member has a personalized view, chance to add/remove columns and see relationships inside an elaborate Gantt chart. Also there are Activities, WBS, OPS, resource assignments views, which offer full information regarding the specified topic. (2) Use Filters, Auto Filters, Groups and Sorts to organize data - The project team members have flexibility when viewing their Activities and Filters, which is a basic feature needed to easily handle plans that contain hundreds of lines/activities. Users can create own Filters and Groups by applying single or multiple criteria and perfectly organize the activities with focus on the important project aspects. (3) Work with custom layouts (import .plf files) - The team members can create and share their own personal layouts in XML. In addition, they can import the company’s custom layouts in PLF format or choose how assignment data is displayed in their view. (4) Compare Baselines of project schedules - Users can easily spot what has been changed from the previous schedule with a clear visual comparison of the Activity updates from previous .xer file version. (6) Generate Reports, analyze schedule quality and KPIs - Users can create default and custom reports, analyze project KPIs and schedule quality, measure the project progress and communicate information more effectively with all project stakeholders. 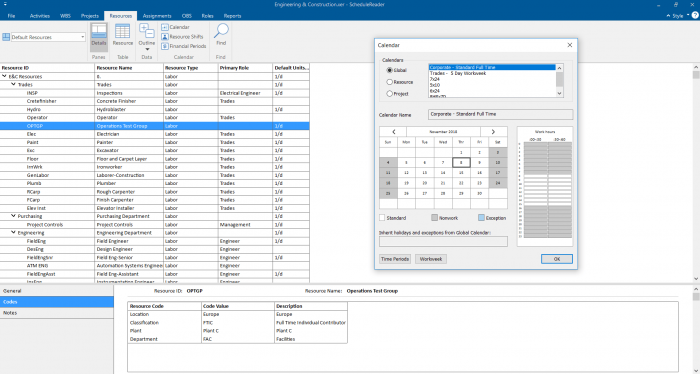 ScheduleReaderTM is compatible with and can be used with Oracle® Primavera P6. It is an independently developed reader product by I-Produkts® and it is not a product of Oracle®, nor is it endorsed, sponsored or affiliated with or by Oracle®. Oracle®, Primavera® and P6® are registered trademarks and brands of Oracle®Corporation and/or its affiliates.